Gracilis forms a floriferous shrub of slender habit with small scarlet and violet-purple flowers. See also Fuchsia magellanica Lam. var. conica L.H.Bailey. [RHSD, Hortus, Hilliers', Don]. ‘This fine species of Fuchsia was raised from Mexican seed, in the Botanic Gardens of Edinburgh, in 1822.’ [BR f.847/1824]. John Lindley later commented in the Botanical Register that Fuchsia gracilis var. multiflora was ‘by far the most beautiful of the fuchias that have of late been introduced; resembling F. gracilis in the brilliance of its flowers, but surpassing it in the profusion with which they are produced.’ [BR 1052/1827]. 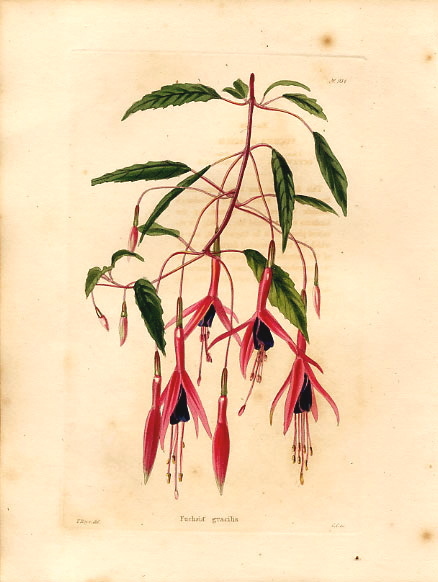 It is figured in Loddiges’ Botanical Cabinet as Fuchsia multiflora: ‘A native of Chili, first raised in 1820, by the Hort Soc, from whom we obtained it. It appears to be equally hardy with the former kinds.’ [LBC no.1415/1828]. This is probably the variety of F. gracilis grown commonly today. ‘A slender twiggy kind, grows very tall; the flowers are large and hang very pendant. This kind flowers well in large pots or the open ground, but requires a rich soil.’ [FC p.176/1834]. LBC no.934/1824. 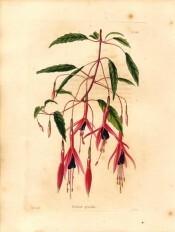 Curtis's Botanical Magazine figures the variegated form, Fuchsia decussata Graham, which was raised from seed sent from Chili in 1822 by Cruikshank. [BM t.2507/1824]. Listed in all published catalogues [T.480/1843]. Fuchsia gracilis was ticked in a copy of the Horticultural Register, August 1831. Although this publication originally belonged to James Bowman, it is likely that it was grown by the extended Macarthur family earlier than 1843.